Own Fireman Sam - Action Sam 3 DVD from Deff, DVD, Blu-Ray & 4K Video Specialists - Free UK Delivery..
Own Fireman Sam - Alien Alert DVD from Deff, DVD, Blu-Ray & 4K Video Specialists - Free UK Delivery..
Own Fireman Sam - Danger By The Double DVD from Deff, DVD, Blu-Ray & 4K Video Specialists - Free UK Delivery..
Sam has organised a Fun Run in Pontypandy for all the local children. But with a chocolate cake 1st prize up for grabs it's not long until Naughty Norman Price is up to mischief to make sure he wins. When his tricks go wrong injuring James and with a search party from the air underway, it's up to Norman to make sure they're found. Will Sam and Tom find them in time? And who will win first prize? Find out in Fun Run. Also features the st..
Own Fireman Sam - Helicopter Heroes DVD from Deff, DVD, Blu-Ray & 4K Video Specialists - Free UK Delivery..
Own Fireman Sam - Help Is Here DVD from Deff, DVD, Blu-Ray & 4K Video Specialists - Free UK Delivery..
Own Fireman Sam - Hero At Sea DVD from Deff, DVD, Blu-Ray & 4K Video Specialists - Free UK Delivery..
Own Fireman Sam - Mountain Rescue DVD from Deff, DVD, Blu-Ray & 4K Video Specialists - Free UK Delivery..
Own Fireman Sam - Ocean Rescue DVD from Deff, DVD, Blu-Ray & 4K Video Specialists - Free UK Delivery..
Own Fireman Sam - Pontypandys Finest DVD from Deff, DVD, Blu-Ray & 4K Video Specialists - Free UK Delivery..
Own Fireman Sam - Red Alert DVD from Deff, DVD, Blu-Ray & 4K Video Specialists - Free UK Delivery..
Everyone's favourite hero next door is back with more action-packed adventures than ever before! Just in time for Bonfire Night fun, join Fireman Sam and the crew in Pontypandy! Everyone is very busy as the town prepares for a rocket launch, while Norman and Mandy make an exciting discovery in the mountains. There's even a runaway bus to stop, and a flood that engulfs the whole town. How will Fireman Sam keep everyone safe? 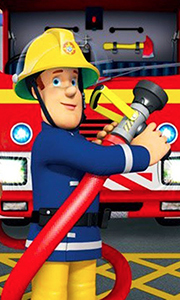 Find out in..
Own Fireman Sam - Sams Birthday DVD from Deff, DVD, Blu-Ray & 4K Video Specialists - Free UK Delivery..
Nee Nah, Nee Nah... Fireman Sam is here to Save The Day! A fantastic collection of adventures which see everyone's favourite Fireman and his friends performing heroic deeds in and around the town of Pontypandy. Be it from training to be the fittest fire fighter to solving the riddle of the beast of Pontypandy; you can always be sure to count on the hero next door!Episodes: Beast Of Pontypandy Fit For Nothing Neighbourhood Watch Out T..
Own Fireman Sam - The Day Of The Penguin DVD from Deff, DVD, Blu-Ray & 4K Video Specialists - Free UK Delivery..
Own Fireman Sam - The New Hero Next Door DVD from Deff, DVD, Blu-Ray & 4K Video Specialists - Free UK Delivery.. When it comes to playing hide and seek in Pontypandy - Norman really is the best! However, when he decides that he is going to hide at the top of the fire station training tower, he doesn't realise that a practice exercise is going to take place there later that afternoon! When the exercise quickly turns into a real rescue, Sam and the crew are on hand to leap into action and save Norman from the Towering Inferno.Episode List: Dinosau..